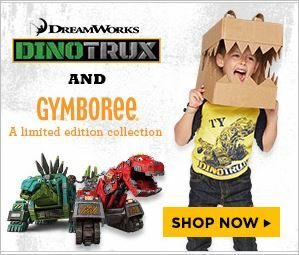 Gymboree just announced their new limited edition line of kids’ clothing tied to the upcoming Dreamworks Animation movie “Dinotrux,” plus, for a limited time, you can take advantage of buy one, get one free deals on wonderful Gymboree items! As if that isn’t enough, you can also get 30% off already discounted new markdowns. A Gymboree coupon code isn’t required for these sweet deals! As always, you’ll want to act quickly with such a fantastic sale at Gymboree to snag the best items in your children’s sizes. I picked out a small selection of Dinotrux and other gorgeous Gymboree clothing to display, but you’ll want to check out the whole Gymboree site to find the right clothing your child still needs for school. As a cat person, I especially love the cat sherpa jacket, cat ears headband and other cute kitty items below. Remember, you don’t need a Gymboree coupon code to nab these fantastic deals on very special clothes. Which are your favorite Gymboree items?